Eggplant is a funny one. 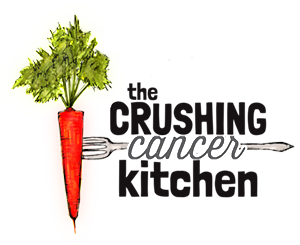 Many people say that they don’t like it, but it is tricky to cook, so I can’t help but think that some of those people have only tried it when it was poorly prepared. It is so exotically beautiful with its big round curves and deep purple sheen, it’s at least got to be worth a second chance, right? I happen to be a lover of eggplant (or aubergine, a more suitable, dignified name that the rest of the world seems to call it). It is bland and creamy and a willing, soft vessel for flavour. It’s like the beanbag chair of foods (if the beanbag chair looked like a modern Scandinavian recliner until sat on/cooked at which point it turned into a beanbag chair). Am I selling it? I think I’m off topic. Eggplant needs attention to taste good. First of all it needs to be cooked, and by cooked I mean not just cooked but cooked through. 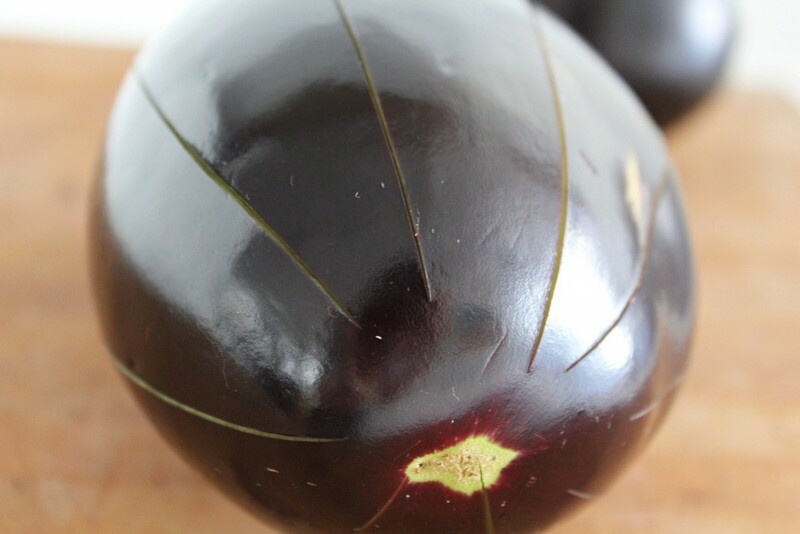 A chewy, spongy eggplant is part of where its bad rap comes from. Secondly, it needs companion flavours, preferably ones that bring big flavour. Garlic is sort of an obvious choice, which it why you often see eggplant and garlic together whether in a Mediterranean or Asian-style dish. 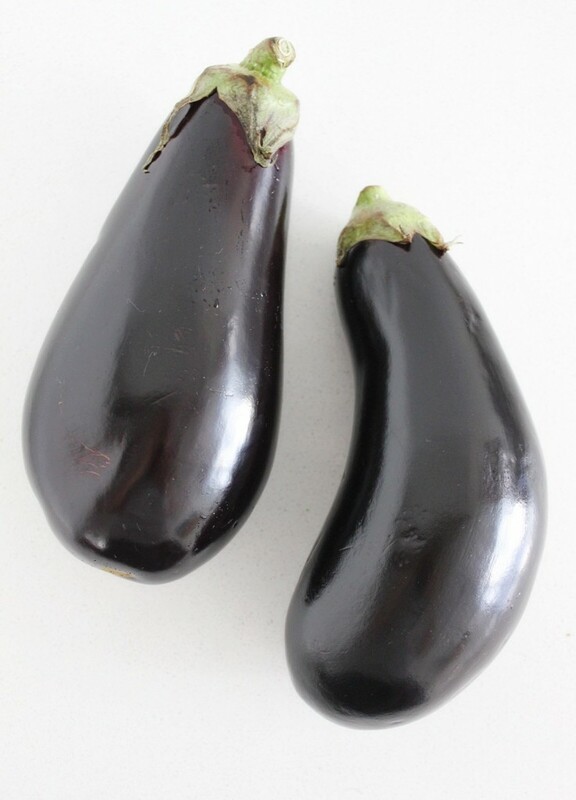 Eggplant also loves fat, which is why it is often fried like in eggplant Parmigianino or in a slippery, greasy stir-fry. 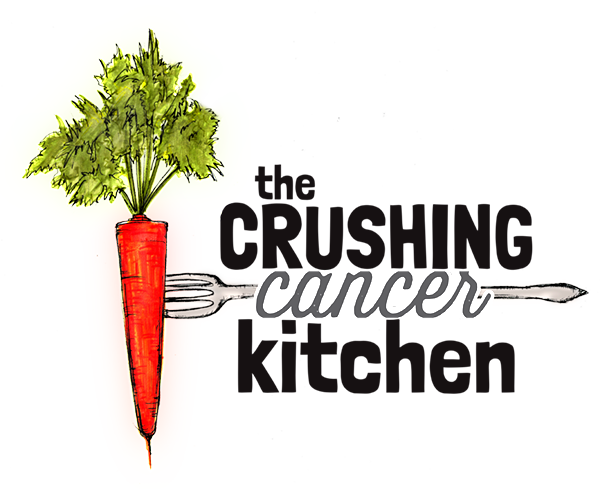 We don’t really fry around here, but don’t worry, there are other, healthier ways to coax out the good times. 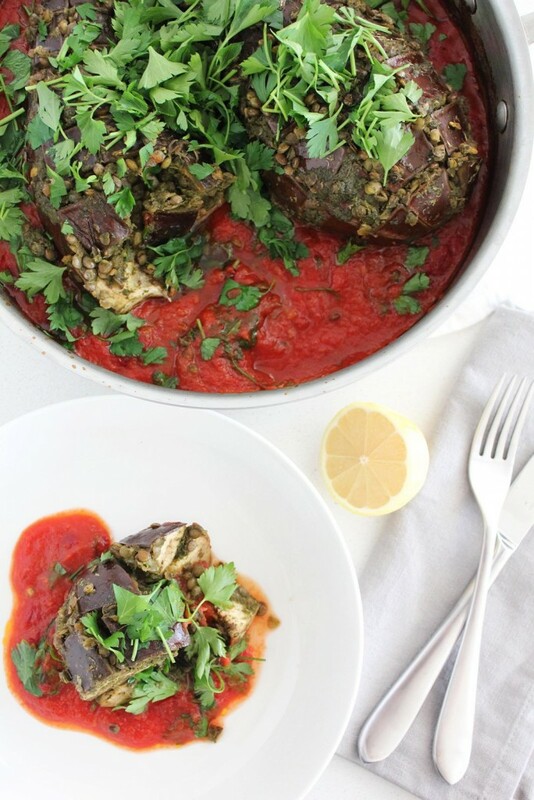 We ensure this eggplant cooks through to its soft, yielding potential by baking it in liquid (garlicky tomato sauce in this case, hello lycopene and allicin). 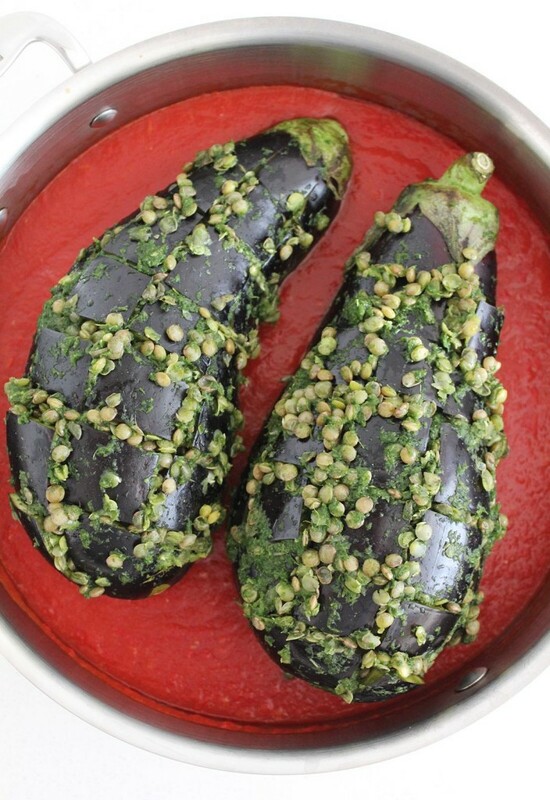 Once covered with a lid, the tomato sauce will help steam the eggplant while it roasts, providing enough heat and moisture to mellow it out to that texture that the true eggplant fans crave. Now for flavour and nutrients, two things that eggplant needs a little help with (it’s a vegetable, it’s nutritious, but its no broccoli) –lentils (iron, folate, fiber, isoflavones, earthy, grounding flavour), garlic (antibacterial, anticarcinogenic, antifungal, big savory flavour), fresh herbs (promote circulation, digestive aid, antioxidant, and fresh, lively, non-beanbag chair flavour). 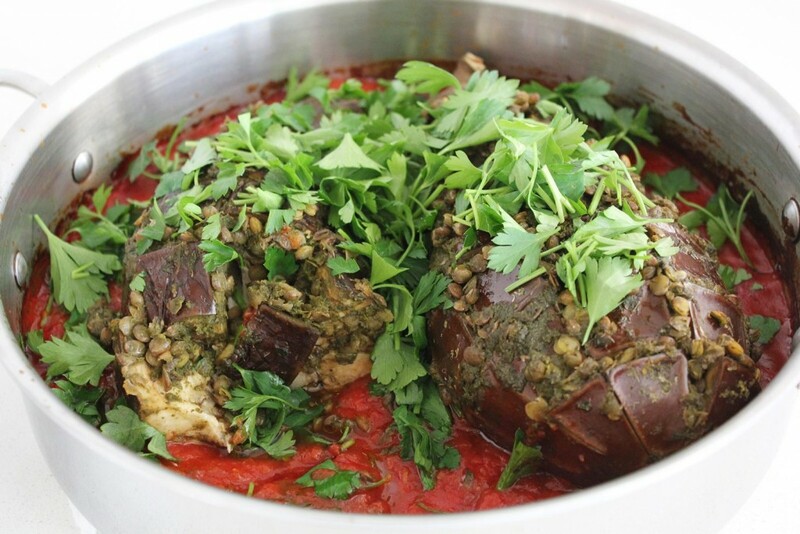 The sweet tomato sauce and big handfuls of fresh herbs added at the end, contrasted with the ones cooked deep inside the eggplant cracks, make this pretty delicious too. 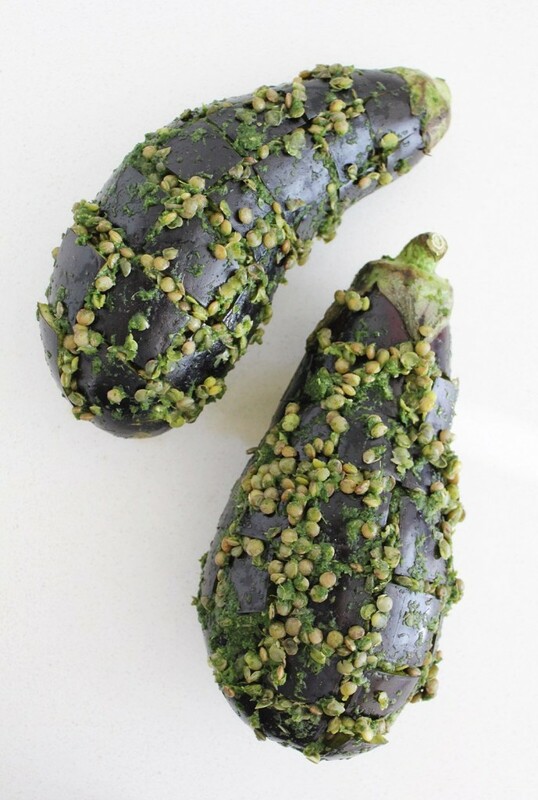 We get those flavours deep inside by scoring the eggplant in a way that I find hard to describe in writing, but I’ll try (there are also pictures). Take a knife and cut into the eggplant lengthwise but only a third of the way through to the other side (not through). Repeat this all the way around. Then cut it widthwise all of the way around…..but only a third of the way through. If this sounds suspiciously like math to you, just look at the pics and remember not to cut it all the way through. You basically want a tube of uncut eggplant running up the centre. I’m going to stop now, let me know if you have any questions. Now you have a bunch of cuts to squish the herb and lentil mixture into. It will look so pretty going into the oven and less pretty coming out, but that’s what the final fresh herb scatter, lemon juice and extra virgin olive oil glug is for at the very end. The truly beautiful result is something reminiscent of pasta with no pasta in sight. This isn’t to stop you from spinning out some zucchini noodles to serve under it and sprinkling some nut-based parmesan over top though. 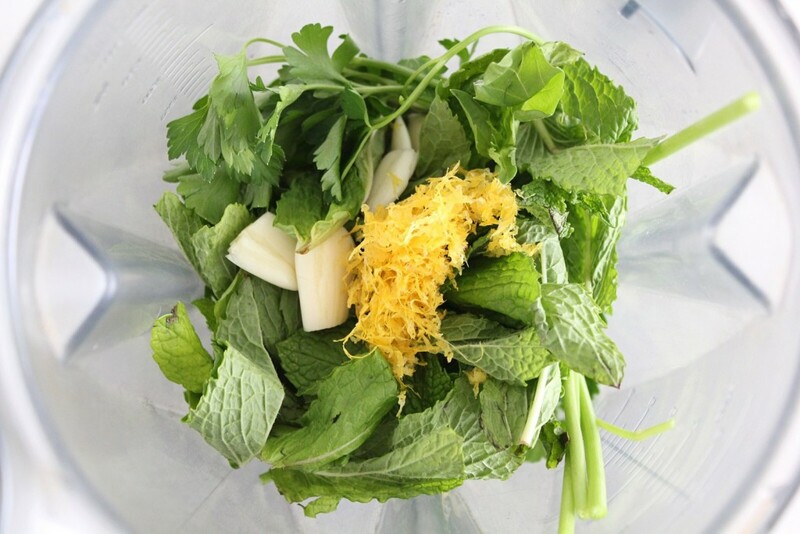 In a blender, blend the herbs, garlic, water, spices, lemon juice, zest and salt until roughly blended. Mix the herb mixture with the cooked lentils. 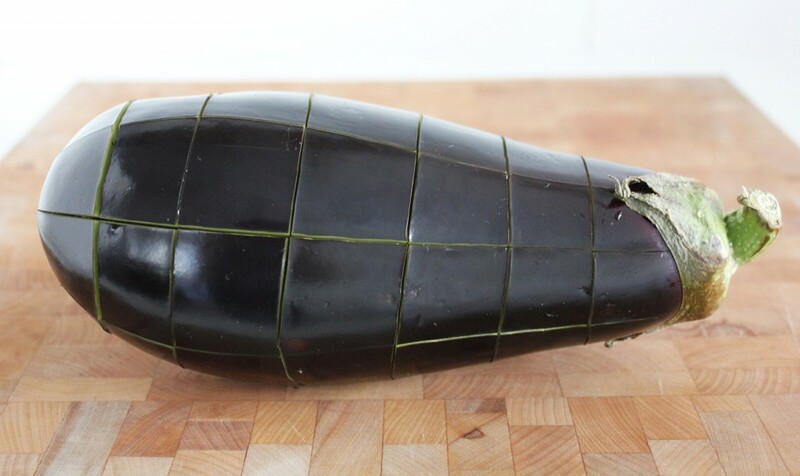 Score the eggplant lenth-wise all the way around (only ¼-1/3 into it) and then width-wise all the way around (also ¼-1/3 in). 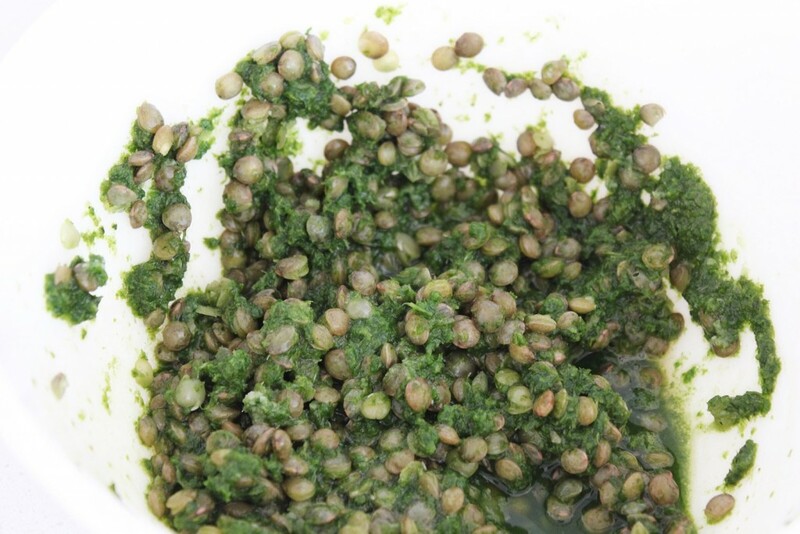 Using a spoon and your fingers, squish the lentil and herb mixture into all of the cuts. In a saucepan (preferably with a lid that fits) sweat the garlic in the coconut oil on medium heat until it is fragrant. Add the tomato passata, mix it well, bring to a simmer and turn it off. Nestle the lentil-stuffed eggplants into the sauce (or transfer the sauce to a ceramic dish with a lid and put the eggplants in that). 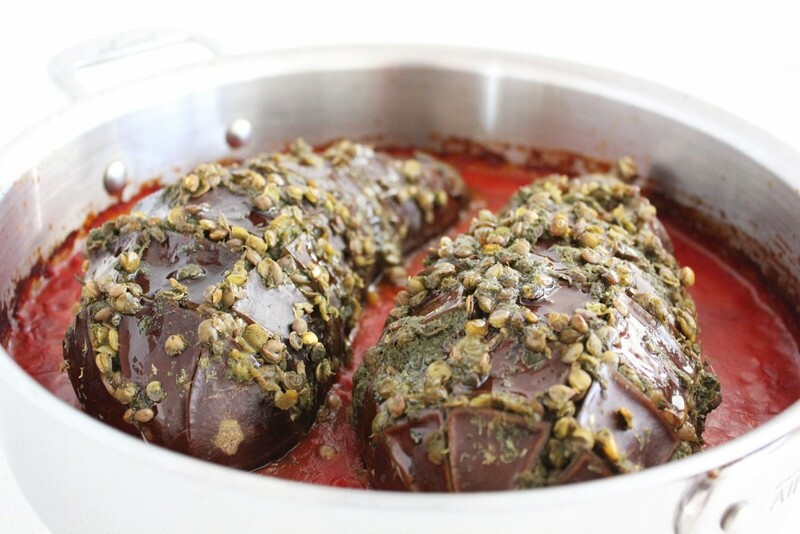 Put the lid on top (or lightly cover with foil) (not touching the food) and bake for 75-90 minutes until the eggplant is tender all the way through (the time will vary based on the size of your eggplant). 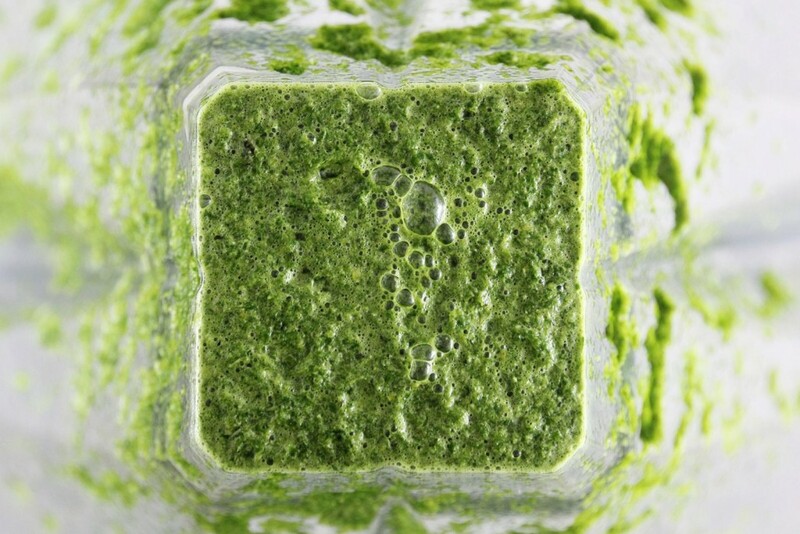 Finish with roughly chopped fresh parsley, olive oil and fresh lemon juice, and serve. It would be perfect in a Ditch oven, good idea. I think u meant u served it with freekeh? That would have beefed it up for sure, nice one. Thanks Jaimie! I’ve already made this twice! 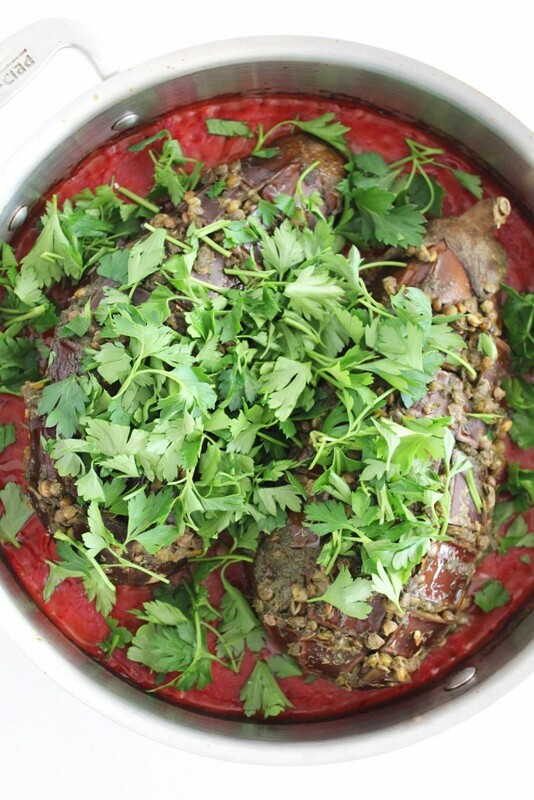 I used my big Dutch oven the second time so that I could increase the recipe :) It brings flavours out of the eggplant that I didn’t know possible. So good!! I served it with freaked.